POLL: Anti-social behaviour ‘targeted robustly’, police says – but what do you think? Anti-social behaviour is being ‘targeted robustly’ by police in Arun, the force has said – but what do you think? Sussex Police has come under fire from residents and business owners in Littlehampton and Bognor Regis, who have claimed in the past that police do not come out to reports of vandalism or other anti-social behaviour. Now, Sussex Police said officers and staff will work closely with Arun District Council and British Transport Police to target known trouble-spots and trouble-makers, and acting on information received. 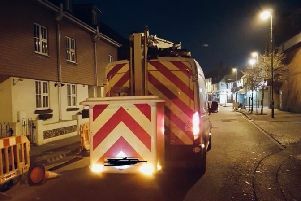 Prevent Inspector Tony McCarthy said: “We are well aware of recent problems in the Bognor and Littlehampton town centres along with issues in Rustington and East Preston. “I am mindful of the concerns raised by the communities in these areas with regards to the ongoing anti-social behaviour. “I want to reassure people that there has been a significant investment of police time into addressing this, not only in terms of enforcement activity, but also in liaison with other agencies who can help tackle some of the root causes of the problems that have been reported. “There has been concern raised by our community and this has stemmed from a known group of youths aged between 12 and 15. We will confront and challenge the actions of individuals within the group and prevent their unacceptable behaviour from continuing. “My message to those who persist in causing an anti-social nuisance in our public areas is clear; you will be identified and targeted robustly to prevent your unacceptable behaviour from continuing. “Anyone affected by anti-social behaviour in this area is encouraged to report incidents to us without delay. This comes after Littlehampton Town Council held a public meeting last year, where residents had a chance to question police and crime commissioner Katy Bourne about police funding, and East Preston residents were up in arms about drug dealing in a recreation ground. In February, police said they were taking ‘positive action’ against the group of youths blighting Bognor town centre. Details of incidents can be reported to police online or by phoning 101, quoting 47170171200. In an emergency or if a crime is in progress, dial 999.